This Speech Processor is a classic from the early 80's and is a fantastic way to boost your modulation whilst still using the standard microphone. it is the perfect companion for a radio of the era (such as a Uniden 200 or Harrier CBX). on AM and SSB this processor comes into its own, providing loud, crisp and punchy audio. As standard, this processor is NOT compatible with modern CPU controlled radio's and can possibly damage your radio. I recently wired this unit to a President Lincoln and when plugged in it made the display go wierd. Since then I have modified the wiring on the processor (by adding a relay to seperate the radio's TX line) to make it work. Update: Whilst using the unit for a few days I was getting reports of a buzzing. Since then I have added C1 and C2 to decouple the audio in and out. The easiest way to think about the wiring for this unit, is to consider it as a microphone extention lead. All of the wires going in must go out in the same manner, that is, if the ground wire in your mic plug is on pin 1, then the ground wire of the mic socket on the processor must be moved to pin 1 and also the ground wire of the output plug must be moved to pin 1. 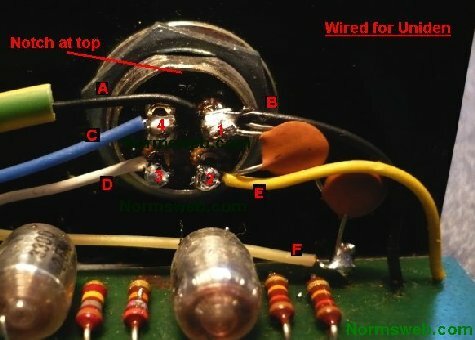 Do this with the TX wire and the RX wire too, wiring the input socket and output plug according to your radio's microphone wiring. The audio (mic) wire is the only one that does not go straight through. The audio (mic) pin on the input socket goes into the processor (E in pic) and the audio (mic) wire going to the output plug connects to the output of the processor (F in pic). Wiring in this manner means that you will be able to unplug the mic from the processor and plug it directly back into the radio. You will notice that on the mic socket there is a wire going from pin 1 to the processor board, this is how the processor gets its grounding. It does not need a ground wire to PSU. The TX pin may have 2 wires also, one going to the radio and the other going to the processor. A = Ground to Radio, B = Ground to Processor, C = RX to Radio, D = TX to Processor and Radio, E = Audio (mic) to Processor and F = Audio (mic) out from the Processor to the Radio. For Cybernet wiring swap pin 1 with 2 and 3 with 4. For this unit to work, it needs BOTH of the 9v batteries to be installed AND the red wire going to your power supply. If you do not have the batteries installed you will not get any audio at all. This unit does not have a black (negative) wire, it does not need one as it gets its ground from the microphone socket on the radio. All of the 8 pin DIL chips in the unit are TL061CP low power J-FET input op-amps. If you're getting a loud buzzing when tx'ing, You may need to replace the batteries. in this processor, when the batteries go flat, initially your modulation will become quieter - but if the batteries drop below a certain voltage you will get a loud buzzing.